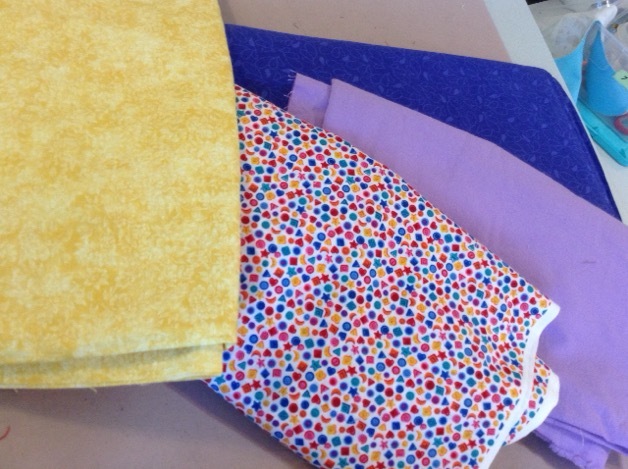 Excited to start another mystery quilt train ride? I am! So in order not to make this intro too long, all of the returning passengers know my welcome speech and after all this time, are probably bored to tears with it! So you’ve never done one of these mysteries, just go and pull up the #18 mystery and read my blah blah welcome! We will start cutting and sewing next Saturday, all postings will be at the normal 8:00 Arizona time – with daylight savings, that will be 8:00 on the west coast, and 11:00 on the east coast. Final clues will be posted on May 5th. At the end of the 18th Mystery, I said that this 19th Mystery would be using many Half Square Triangle blocks. Please don’t let that stop you, you can become a HST expert after making this project! There are so many ways to make this block, I know you will find a method you like. Or experiment with different ones and select your favorite. No matter what method you choose, they will all turn out the same size. So, I have decided to make my sample quilt about 42 to 46” square, depending on how much border you want to add. This could be a table topper or wall hanging. I want to make 9 blocks so that you can see the fabulous secondary pattern that emerges at the end. Those of you who go bigger can multiply the directions by making 4 times the number of blocks to make something double the size plus any borders you want to use. And then at the reveal, you can decide if you want to make even more blocks. But I have not done any math on how many blocks you need for whatever size you wish to make. Whether you are doing scrappy or not scrappy, you should have dark, medium and light values for the pattern to show up as I planned it. At this point I wouldn’t worry about the background, you can choose it next week when you see what you will be making. If you are using, for example blues or greens, you won’t have a problem finding light, medium and dark. Some background color is needed, and a sashing and border colors, to be determined when you have the nine blocks completed. I suggest small to medium prints, tone on tone, solids, etc. Don’t forget, you will be making many HSTs and a large print would get lost in the small block. You can also use yardage, 3 different fabrics in a light, medium and dark, and a background fabric. From light you will need ½ yard. From medium you will need ¾ yard. From dark you will need 1 yard. 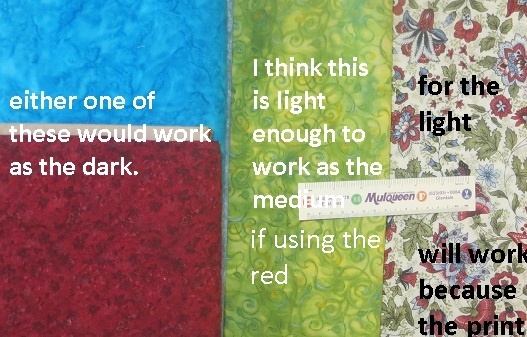 I have shown a few examples of what I meant by light, medium and dark yardage. And 1-1/4 yard for background. I knew I wanted to make this monochromatic plus a contrasting background. . I have a drawer of aqua that I was going to use. But I love gray and seem to have a bigger collection of these small pieces in the gray drawer, so I chose to make a scrappy family of grays. However, as I was working on the gray fabric scraps, I found I needed very dark gray, so I had to go into charcoal and used some black with a bit of gray. 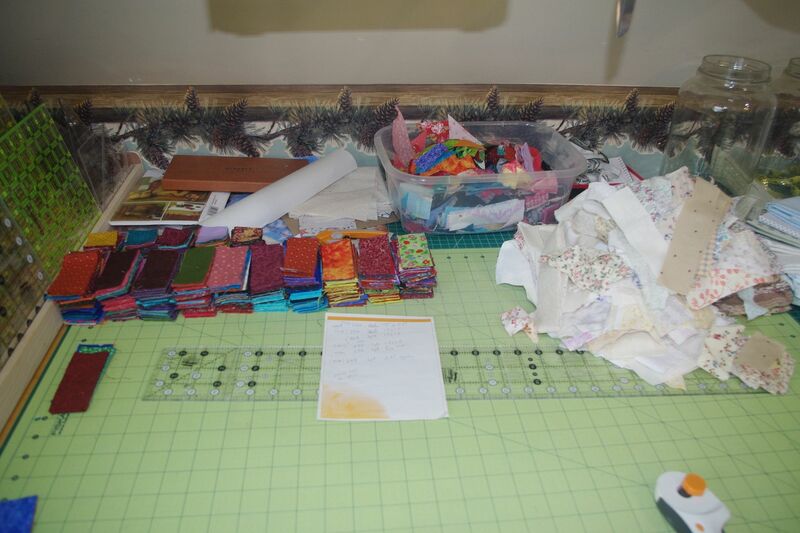 I pulled from my scrap drawers a sample of colorful fabrics if you are not doing a monochromatic quilt. You can see I have a selection of light, medium and dark fabrics. On the far left side, there is a green labeled OOPS! I felt this was to light to use as a dark. And on the far right, there is a leaf pattern that I felt would be too dark for the lights. It’s amazing how different things look to me when I take a picture! Background fabric -- If you plan on using a white for the background, do not use your light fabrics with a white background as blocks won’t show up well. And if you are using something dark, don’t have it be one of the darks you are going to use for the blocks. Perhaps black, but then make sure there is some contrast with the black and the darks. Clear as mud? Hope all becomes clear next week. This should be enough information to get you stash diving, or doing yardage selection. Any questions, ask away. I will be lurking in the club car with a cup of coffee and a breakfast burrito, ready to see what you are coming up with. Most of all, have fun! I can't wait to get started! I brought quiche and fresh fruit it's located in the dining car. Good choices, Cheese, get us off to a healthy start - the fruit will offset my burrito! Jumping on board again. I love your creativity. I’m excited to see where this train ride takes us. You do not simply stumble upon the happy life.....you make it! I'm here too. Hope Lynnie makes it with some chocolate wine... lol. yup, Mary, guess it is never too early for chocolate wine! I have yet to try it, only think about it when someone on the train mentions it! I am in the Observation Car. I have too much on my plate at the moment to start another project. But will possibly cut it into a kit as time permits. I'm here. Can't wait to start. I'm bringing the leftover Easter candy - so I don't eat it all myself lol! I'm in and so excited!!! I'm jumping aboard this train ride. It looks like it will be fun. I rather make a million 1/2 sqs than do most other pieces. I just do long stripes of the sqs at a time. Would it be scrappy enough if we had 8 1/2 sqs a like? Or do they have to be all different? Or is this too much info at the start of the mystery. By the way, I'm putting my sashing on my blocks and working on my borders for Mystery #18. When I get top pieced, I will post pic. I'm still deciding if I want piano keys or 9 or 4 patch for final boarder. I'll decide after the sashing and blocks are put together. I left nachos, 7 layer dip and chocolate cupcakes in the club car. Now back to work. I've decided that I best be in the observation car too. After reading the introductory notes, it seems that the flannel shirts will not lend enough contrast to show off the secondary pattern that Judy mentioned. Thank you Judy for all the work and great pattern ideas. I will definitely keep this information for future use. Carol, I think this is a wise decision to save your lovely flannels for a better project. Happylab not quite sure how to answer you. 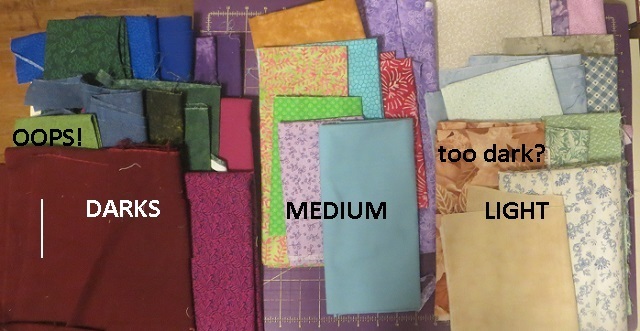 If you don't have a lot of scraps, you can easily do yardage.If scrappy, my feelings are this: the more variety, the better. I have some chocolate cherry wine...can I jump on this one? I'm in. Will these fabrics work, Judy? The multi colored print is small and I'm thinking of that as a light. It could be background also and I could switch the yellow background with it. IceLeopard: The more, the merrier! Judy's mysteries are a lot of fun! Signing on again! I am at a quilt retreat at the moment so will have to search the stash when I get home, unpacked and......Looking forward to this ride again. Nearly finished with 18! Looking forward to seeing where this train is headed. I already have loads of small HST since I always sew the bonus HST from blocks. retired - I think these will be fine as you described their positioning. I sent you a PM about the yellow. I also have some chocolate cherry wine. It came from St.James winery here in Missouri. It's a little sweeter than I usually like, but very good. Of course you can jump aboard anyone is welcome. We do have a good ride. Connie pretty fabrics you choose. Hi Judy, Can I use a charm pack or a layer cake, considering size of half-squares? Here is what I pulled out so far. I have plenty of red in my stash to fill this out as needed. The fun part will be deciding on the background fabric - I expect that is going to have a big impact on the end look. 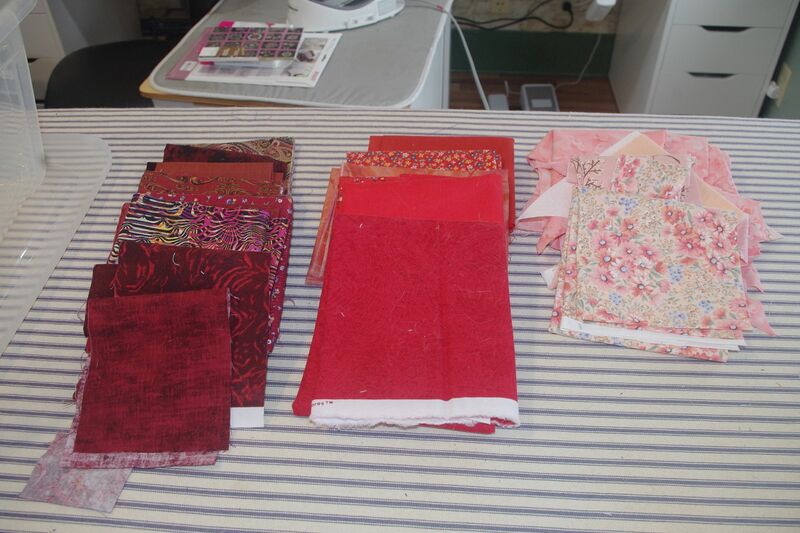 I've been going though scraps and cutting them up for another scrappy quilt. This one needs about 1,250 1.5x 3.5 strips and 600 1.5" squares. These are stacks of 100 so I'm almost there. Then on to the neutrals. Last edited by Macybaby; 04-08-2018 at 08:27 AM. I'm jumping aboard also. I haven't finished #18, finally put it into the UFO pile. Everything is cut, waiting for me to start up again.